Final casting has been revealed for the West End transfer of The Old Vic’s Girl From The North Country, which reopens at the Noël Coward Theatre at the turn of the year. Joining the company of Bob Dylan and Conor McPherson’s drama will be Finbar Lynch, who will play Reverend Marlowe, and Ross Dawes, who will form part of the ensemble. They will join a returning cast which features the likes of Ciaran Hinds (Game Of Thrones) as guesthouse owner Nick Laine, Shirley Henderson (Trainspotting) as his wife Elizabeth, and Sheila Atim (Donmar Shakespeare Trilogy) as their daughter Marianne. Finbar Lynch’s extensive previous theatre credits include starring roles in the Donmar Warehouse’s revival of The Lady From The Sea earlier this year, as well as in Richard III (Almeida Theatre), and Ma Rainey’s Black Bottom (National Theatre). His television credits include Foyle’s War, DCI Banks and Game Of Thrones, and he was nominated for a Tony Award for Best Featured Actor in a Play in 1999 as Canary Jim in Not About Nightingales. Ross Dawes, meanwhile, recently starred in the West End runs of Charlie & The Chocolate Factory and Shrek The Musical. Girl From The North Country is set in 1934, and, in the midst of the Great Depression, a Duluth, Minnesota family sits on a knife edge, their future indeterminate. Lost and lonely people drift through the rooms of their guesthouse, as the future of the community teeters on a knife-edge, in a tale which weaves the iconic songbook of Bob Dylan into events. 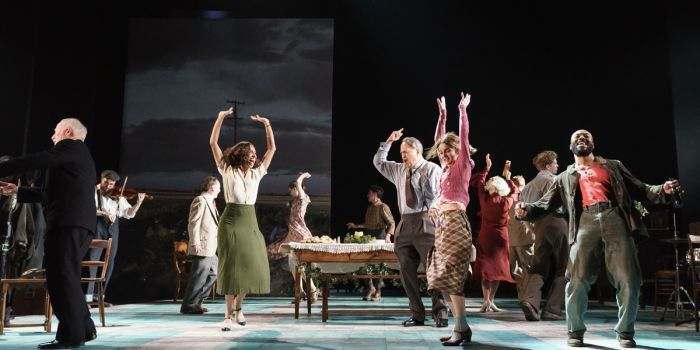 Girl From The North Country previews in the West End from Friday 29 December, with press night on Thursday 11 January 2018. Book Girl From The North Country tickets today.